Why do we get that tingling sensation, that sudden wave of emotion, that thrill when we see the haystack paintings of Bruegel, Van Gogh and Monet? Who would have thought haystacks would be so enthralling? Do they speak to our yearning for a simpler way of life? We know from brain research that the color yellow arouses feelings of happiness. Yellow is the color of these haystacks. Some of the greatest artists of our time have devoted themselves to painting these simple images. The Flemish Renaissance artist, Pieter Bruegel the Elder, would put on disguises so he could participate in the life of the peasants…capturing their field labor and rollicking celebrations in his paintings. 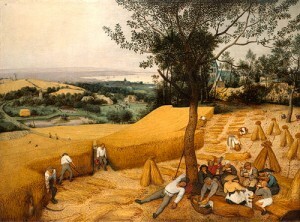 The Harvesters portrays the arduous work of gathering the hay and the peasants’ joy of the well-earned picnic. Bruegel’s use of the golden yellow color of the hay fields is delightful to our senses. 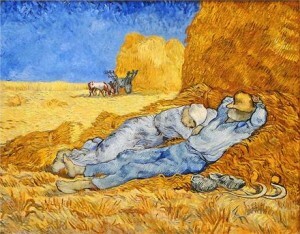 Hay gatherers are snoozing in Vincent Van Gogh’s famous painting, The Siesta. We sense the slow pace, the pleasure of a nap. Van Gogh uses his signature palette of intense yellows and blues to evoke emotion. 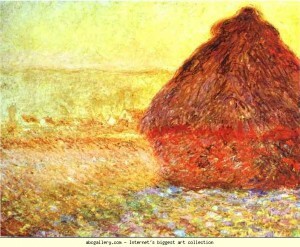 Claude Monet, the Father of Impressionism, was so charmed in 1890 with haystacks he painted 25 canvases of them! These haystacks are astonishing with the differences in light at various times of day, seasons, and types of weather. They are some of the most beloved works of art in the world. This Bruegel video is almost as good as seeing his masterpieces in museums! For thrilling color, watch this brief van Gogh video. Watch this for Monet and all his glory. Loved this. Thank you so much. Never before thought of Bruegel as an abstract artist, but now I do. Kirby, I wish I could paint!!!!!!! I must be blurting that out, because I enjoy seeing the paintings so much and also assume the artists equally enjoyed creativing them. Or maybe I wish I could bring that much visual meaning and pleasure to the world of onlookers. I already know you’ll tell me that I CAN paint if I want to. But apparently I’d really rather go take a nap in a haystack. Let’s all go take a nap! Kirby. Enjoyed the videos very much. I think that I am basically an impressionist in disguise – actually successfully hidden. Was unaware that hay stacks were such important subject, but I’ll be damned they apparently are a significant objects d’art. Never really liked yellow except for shading and highlight. Got to rethink yellow, particularly if suggests happiness. What an interesting blog. I just returned from France where I visited St. Paul’s Monastery near Arles where Van Gogh did about 150 paintings. We saw the scenes that he painted, including Starry Night, the olive trees, his bedroom, etc. It was very peaceful and inspiring. What a gifted painter! We also visited Giverny where Monet lived and painted his water lilies and invited other Impressionists to join him in painting. Very glorious–you would have loved the colors. So thank you for this writing on two of my favorite artists–Van Gogh and Monet. Keep up your inspirational work. Thank you Mar Mar for commenting. YOU could have written this post! Haystacks show us, how winter’s fodder comes from summer’s meadows. In their haystacks the respectable farm families present food, shelter, and clothing issues. Should we take a straw vote? clever, clever, Philip! Thanks for commenting! Harvesters. It is not the one that appears everywhere:Jun-July or August -September. I realize that a third of Breugel’s work is kept in a famous European Museum.How can I find the painting that I saw,that seems to have disappeared? Would someone know how to find out? or refer me to an art expert.